We have many of our customers inquire about the best options for holding up curtains. 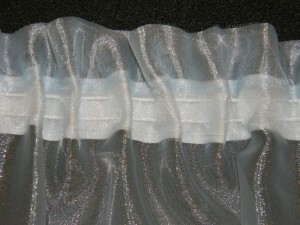 There are many ways to attach your curtains to your tracks, but one of the simplest, especially for light-weight curtains, small RV curtains that are not pinch pleated is to use wrinkle band tape. You may also find this called shirring tape if you go to a fabric store to pick it up. It works like snap tape, but instead of using snaps, it uses wrinkle band hooks to connect the curtain to carriers on the track. To use wrinkle band, you need to do a little bit of sewing first. Just sew the band 1/4 inch from the top of the curtain. Then insert the wrinkle band hooks into the places on the band where you see parallel lines of loose thread over the band. The curved portion of each wrinkle band hook is used in the ring or hook of the carrier that is held on the curtain track. There are two types of hooks you can use with shirring (wrinkle band) tape. Plastic wrinkle band hooks are white and good for multipurpose curtains. You may want to use stainless steel hooks if you want your hooks exposed in a room with other metal accents, like a bathroom. Below is a photo of both the plastic and stainless steel wrinkle band hooks. Please note that if you choose stainless steel wrinkle band hooks, you cannot use them with button carriers (7124) or with ball bearing carriers (84100 or 84102). Those require you to use the plastic wrinkle band hooks. A good way to remember is that the stainless steel wrinkle band hooks pair with carriers that have metal rings, and the plastic hooks go with carriers that are made of plastic parts. To make it even easier, just look for all the compatible carriers on the product page for the type of wrinkle band hooks you are ordering. You can pleat curtains with wrinkle band tape, if you desire. The tape is light-weight enough to not look bulky between pleats on curtains. 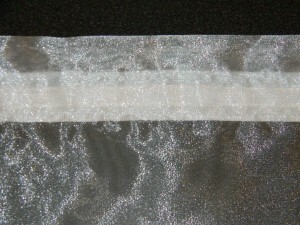 Wrinkle band tape can also help to improve the fullness of the sheers. You just need to attach the wrinkle band tape to the top of the curtain and pull the cords to the width you want. After that, put the hooks into the wrinkle band tape to hold the curtains in place on the carriers. Wrinkle band tape is a good alternative to snap tape if you do not want the curtains to be easily pulled down. If you select light or medium-weight curtains, you should be able to hold them up with the wrinkle band hooks. For ceiling-to-floor curtains, you may be better served by selecting drapery pin hooks to hold the curtains to the carriers in the track. Drapery pin hooks are also a better option if you have pinch-pleated drapes or curtains because you cannot use wrinkle band tape on those. If you are in doubt, contact us to ask about your best curtain support options. To further demonstrate how the wrinkle band works, we have added two images below. The first shows a curtain panel with the band attached on the back, flat, without the cords being drawn. 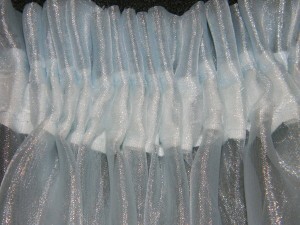 The second shows the pleating effects is the cords of the wrinkle band are drawn loosely. The final image shows the curtain panel with the cords drawn tightly, creating a tight pleating. The method you choose depends on your preference for the appearance of the curtain. Customers have used each of the three looks, and the amount and tightness of the pleats or folds depends on how tightly you choose to bunch the fabric.